Expert VHDL is an intensive 5-day advanced application class. It teaches engineers how to increase productivity by enhancing their VHDL coding and application skills. Presented in two distinct course modules, Expert VHDL focuses on language and synthesis issues,.design maintainability and re-use, test benches and the latest techniques for verification.– including an introduction to OVL/PSL and modern assertion-based approaches to verification. 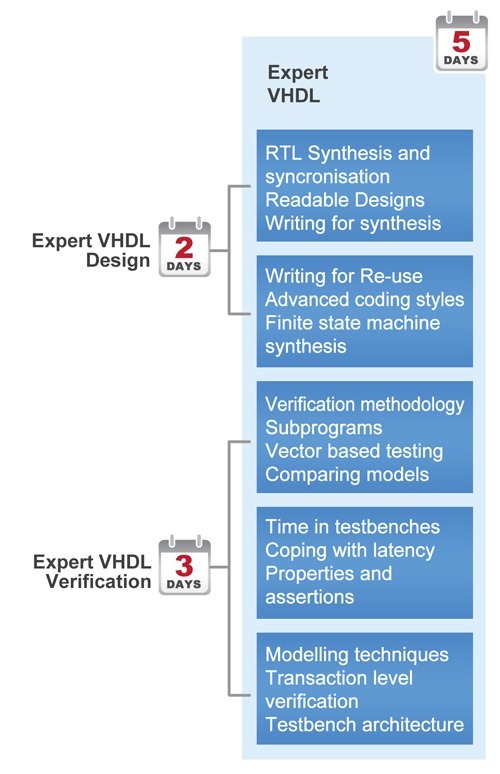 Expert VHDL Design (2 days) is for design engineers wishing to deepen their knowledge of RTL synthesis using VHDL,.and to improve their VHDL coding style with design maintainability and re-use in mind. Design for Verification is also covered with an introduction to modern assertion-based techniques. The modules, which may be attended together or independently, follow on from the industry standard class, Comprehensive VHDL. Carefully designed workshops comprise approximately 50% of teaching time,.and enable engineers to apply their new skills in the context of the latest VHDL design tools, practices and methodologies.